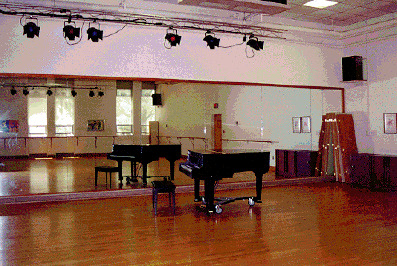 Adair Hall houses the department's dance studio, equipped with a sprung hardwood floor, grand piano, and 66 foot mirrored wall. Stage lighting equipment, a sound system, and free-standing screens transform the studio into a performance space for concerts and showings. An extensive collection of percussion instruments, audio/video equipment, recorded music, dance films, and videos are available for coursework and independent study. Dance concerts are presented in both the Adair Hall dance studio and on the Kimball Theatre stage.